IDF bombs 70 Hamas, Islamic Jihad targets, including terror tunnels, in response to launch of 200 rockets at Israel. 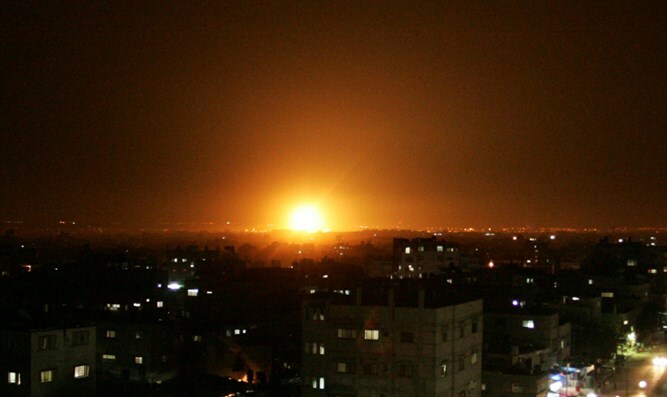 Over the last hours, IDF fighter jets, attack helicopters, aircraft and tanks targeted over 70 Hamas and Islamic Jihad military targets throughout the Gaza Strip in response to the launching of 200 rockets at Israel by terrorists in the Gaza Strip. Among the sites struck by IDF fighter jets are Hamas military targets, including: an offensive terror tunnel in Darj, four military compounds in Rafah and Deir al-Balah, and a military observation post in Jabalia. In addition, among the sites struck are Islamic Jihad targets, including: two offensive terror tunnels in Rafah, a weapons manufacturing site in Rafah, four military compounds in Nuseirat, Rafah and Beit Lahia, and a military post used for launching rockets from Jabalia at Israel. The IDF stated that it views the attack on Israeli communities with great severity. "The Hamas terror organization is responsible for all events transpiring in and from the Gaza Strip, and will bear the consequences for its actions."